Our thanks to Galia fpr bringing us yet one more video interview. This one from Gente TV. © Gente. Images © AP. 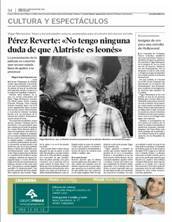 It has been a while since I've enjoyed a movie as much I did on Monday at the press screening of Alatriste in Madrid. I was tired of seeing Hollywood "superproductions' in which directors and script writers ran piteously roughshod over our history because they are completely ignorant about how actual events unfolded, and yet take the liberty, without apologizing, of plastering across the silver screen their version of something that's as alien to their idiosyncrasies and culture as quantum physics would be to a chimpanzee. If there's one thing we should be grateful to Agustín Díaz Yanes for, it's his ability to have maintained a finger on the pulse of Hollywood, while not allowing himself to be overtaken by the fantasy, the anachronism, or above all, that tendency of directors to follow in the footsteps of 'the masters' who repeatedly depicted the history of Spain as yet another movie about swordsmen and intrigue. 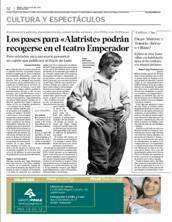 Alatriste is, above all, an ode to liberty. An adventure film straight out of the classics. Agile, vibrant, with all the qualities inherent to the novels of Sabatini and Dumas including a dash of romanticism, in addition to sly winks at codes of honor, camaraderie, and that dichotomy between heroism and villainy which can be no other than the hallmark of the disenchanted captain of the old Tercios of Flandes, who maintains his honor in spite of being a relic of its glorious but decrepit past. From the very beginning of the movie, Yanes puts his cards on the table. What the audience is about to see will be pure onscreen action, but not the American kind we're accustomed to seeing. Instead, the action is almost meditative, indescribably careful, and leaves nothing to be improvised because the director knows so well the power of a poetic narrative to communicate on the basis of glances, gestures and verbal insinuations, rather than relying upon mere physicality, though that also exists onscreen, of course, and in good measure. Every one of the scenes has the indelible stamp of a director who, above all, cares about the work of his actors. Yanes doesn't depict, instead, he dissects, and it's true that the script, his script, occasionally seems to downplay the rest of the story in favor of fleshing out the character of the hero, leaving the detective work to the audience, who must confirm their own hunches as well as responding, or intuiting, small important details which are not sufficiently highlighted onscreen. On the other hand, he approaches each scene, each frame, each movement of the camera and each epic situation like a sculptor contemplating the shapeless mass before him to which he must give shape. And the result is a metaphor of desolation and an ode to the loneliness of the hero who has been battered by life and grieves for Spain with all his heart, in spite of having been disowned by the Empire. 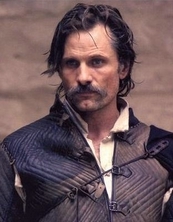 Viggo Mortensen plays his character to perfection. He submerges himself in Alatriste and his terse, murmured and yet sonorous speech is that of one who knows words are extraneous when swords meet. His clear gaze, firm and serene, his calm, fluid gestures and that loyal spirit he has toward his comrades in arms, serve better than any narrative to tell the story of a man who knows irrevocably what his destiny will be, but still keeps hope alive for a future day when Spain will see better times and break free of the agonized struggles it is presently enmeshed in. Juan Echanove is simply Quevedo. With his looks and mannerisms, his way of speaking, of harmonizing, he takes on the challenge of a secondary character who could easily have been diluted, and imbues the role with such innate elegance that what is only half-truth suddenly becomes something you automatically take on faith. Ariadna Gil, the beautiful and sensual María de Castro who is Alatriste's forbidden lover, makes us feel her suffering and profound anguish so powerfully that it's almost as though we are a part of that contradictory, unstable world that is made up of those individuals who are the objects of desire..
Elena Anaya (Angélica de Alquézar) and Unax Ugalde, (Iñigo de Balboa) are the other unfulfilled pair of lovers that reach across the screen and move the audience deeply in spite of their scenes' brevity and the young actor's inattention to his speech. 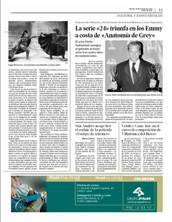 Javier Cámara masterfully portrays the Conde Duque de Olivares and establishes his ruthless personality. But it's Enrico Lo Verso, Gualterio Malatesta, Alatriste's enemy, who maintains a resolute tension and masterfully portrays a character who never forgets and has in mind only one wish: to do away with Alatriste. Copons, Antonio Dechent, and Francesc Garrido, Saldaña, are both very committed to their roles. Roque Baños' soundtrack is admirable, seamlessly integrating itself into the movie and granting the film a strength and brilliance that would be inconceivable without it. A magnificent movie that will serve as a defining line - as a "before' and "after' benchmark of achievement - in the history of Spanish historical film. © Diario de León. Images © Estudios Piccaso / Origen Producciones. 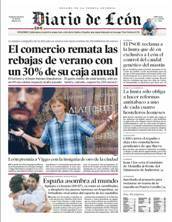 For those fortunate enough to be in León for the Alatriste premiere, it looks like lucky people are going to be the ones who can buy the Diario de León paper for the vouchers. 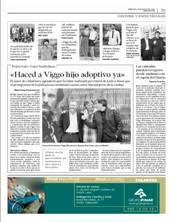 Read all the details at Diario de León.